You will also learn some tips for best practices and common mistakes to avoid. But before all of that, to fully convince you product recommendations are extremely essential for you company, here are some reasoning and statistics to prove it. 1. The feature echoes the item suggestions made by in-store sales representatives that some customers desire. Whereas in-store the sales representatives ask shoppers about their needs, preferences, and affinities, on-site the product recommendations engine automatically generates suggestions based on a combination of rules. 2. 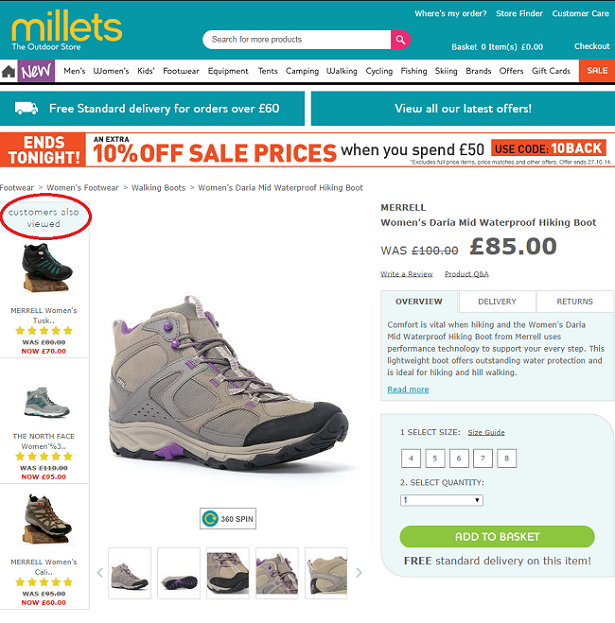 The feature provides e-shoppers a quick and easy way to view relevant items. This can motivate “just-browsing” visitors to make a purchase, help “lost” customers to find their dream items, assist hesitant shoppers to find more fitting alternative items, and encourage “big” shoppers to add additional items to their carts. Since websites offer a vast of items, product recommendations are an effective method to combat the issues caused by abundance of choice, such as abandonment, dissatisfaction, and cognitive dissonance. 3. Dynamic product recommendations transfer the right message to the right shopper at the right time. Dynamic recommendations are as relevant as possible to each specific individual for the specific moment in which they are displayed (more on this is elaborated below). This also means the shopper’s experience is personalized. Therefore, dynamic product recommendations result in an optimization of the product discovery process, better customer experience, more impulse purchases, and higher engagement, conversions, average order value, loyalty, and retention. According to a study by Barilliance, in Q4 2014 personalized product recommendations contributed to 31% of the best performing sites’ revenue, while the global average was 12%. Additionally, customers who click on the product recommendations have a 5.5 times higher conversion rate than those who do not. According to a study by Invesp, 45% of e-shoppers are more likely to shop on a site that offers personalized product recommendations and 56% are more likely to return to such site that recommends products. 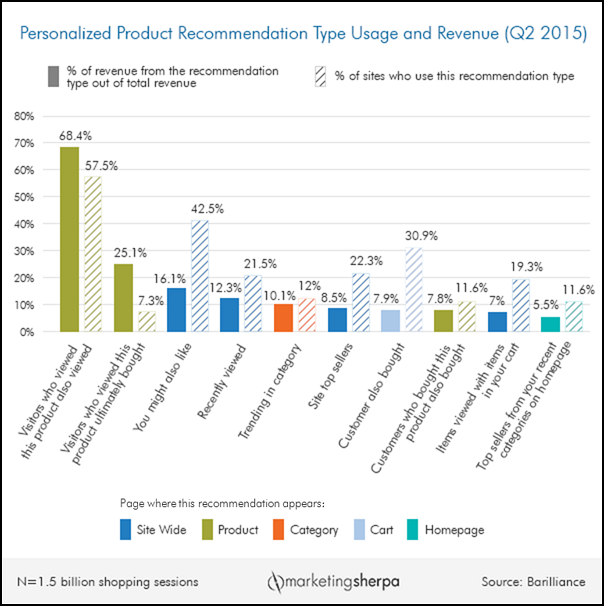 Another Barilliance study found that product recommendations are also very effective in remarketing emails. They can lead to 30% increase in sales conversion rates and 35% in click-through rates in such emails. Individual case studies also prove the effectiveness of dynamic product recommendations. EyeBuyDirect.com experienced a 175% increase in email click-through-rate and 30% in their conversion rate, while Lux Fix experienced a 85.7% increase in email conversion rates. Now that you know what the benefits are and why it is important to implement such a feature, let’s indulge in the mechanics of how it works and how to implement it. First, What Exactly Are Dynamic Product Recommendations? 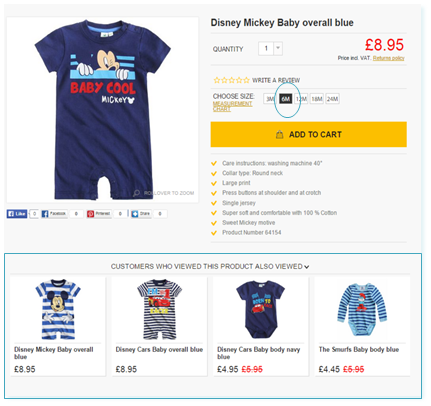 Dynamic product recommendations engine is a feature that presents e-shoppers with item suggestions. The recommendations are automatically personalized and dynamic in order to be most relevant to the individual shopper at the time they are presented. Which Type of Items Are Recommended? This is used to expose the shopper to items that are likely to better fit their needs and desires to increase the chances of a purchase. This is used to entice the shopper’s interest in different items to increase the average order value. A mix of the personalized types using a generic title (e.g. “recommended for you,” “you might also like”). 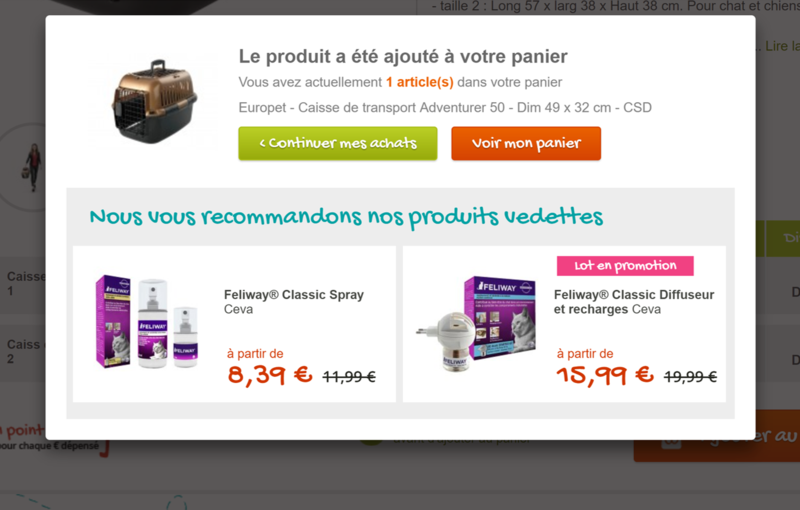 The type of product recommendation presented determines the recommendation feature’s title. 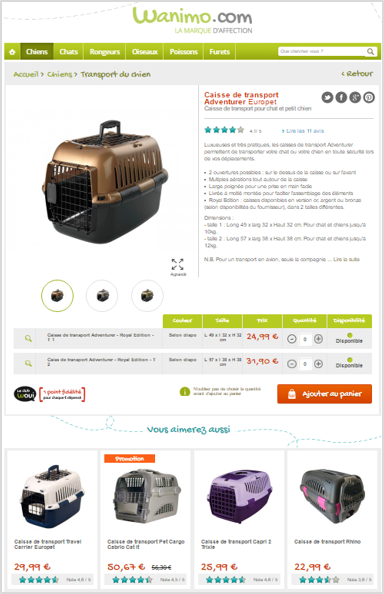 You can find many ways of titling product recommendations of a similar type. Some titles are non-conforming to what exactly they recommend, such as “you might also like.” These titles can display a mixed strategy. There are titles that involve social proof (i.e. “customers who viewed this item also viewed”) and transparency of using your date (i.e. “inspired by your shopping cart,” “related to items you’ve viewed”). These two types of title build trust. Some types of recommendations can be titled differently, which can influence the perception of the shopper. For example, some titles for a cross-selling recommendation set are “frequently bought together,” “complete the look,” and “customers who bought this also bought,” to name a few. 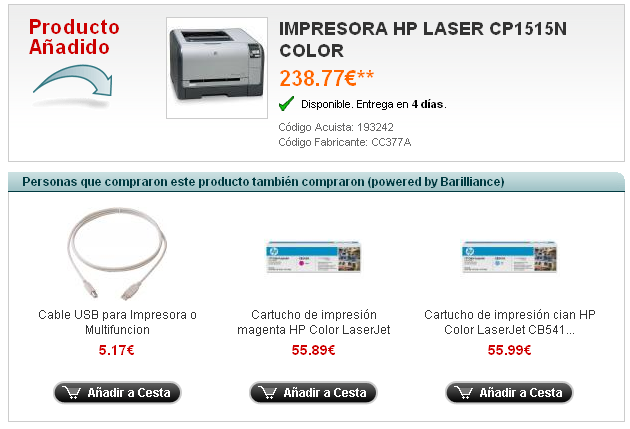 The recommendations themselves show most commonly the image, name, and price (and discounts) of the item suggested. You can also display alternative colors available, sizes available, ratings, social proof notifications, and more. How Are the Items Recommended Personalized? The recommendations engine collects information whenever a shopper engages with the company (on-site, in-store, emails, etc.). This information includes each visit of the shopper, items searched, browsed, put in cart and purchased, as well as rated, reviewed and shared. Integrating this information indicates the shopper’s behavior, preferences, price sensitivity and affinities (i.e. brand, color, size) and more. Demographic information is also included to the shopper’s profile, so the recommendations engine can make suggestions and predict behaviors. The intent of the customer – the shopper’s profile. The biggest consideration is given to the most recent visit and items that were recently added to the cart or purchased. 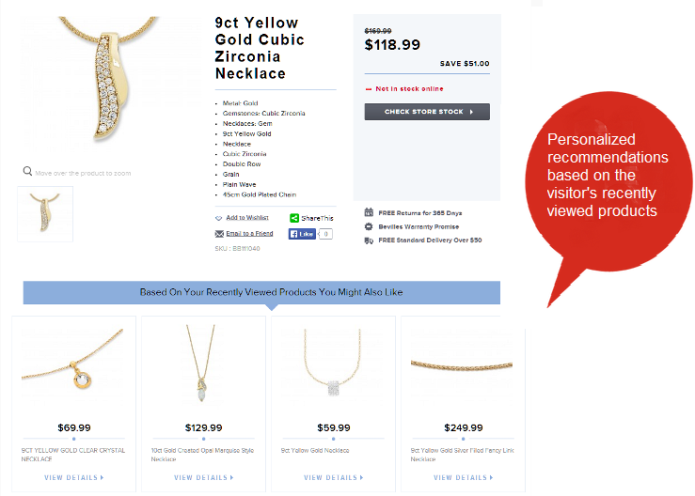 The wisdom of the crowd – aggregated data from a group of shoppers who bought similar items. A customized set of variables – selected categories, such as top sellers, items with a good click-through-rate, and manually selected items. How Are the Items Recommended Generated for New Visitors? A new or anonymous visitor is presented with the final point alone – a customized set of variables as there is little or no data on them. 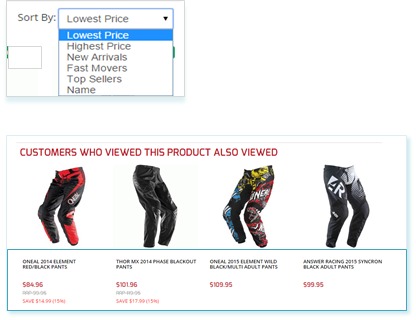 For example, a new user entering the site might see a recommendation set of “popular items” that are items with the best conversion rates on the site. On the other hand, a returning visitor might instead see a recommendation set named “items you might like.” These can also be items with the top conversion rates on the site, but only ones that are specifically relevant to that visitor. A returning visitor may also see personalized popular items. As the new visitor engages with the site, more data is collected, so the type of generic recommendation may change. 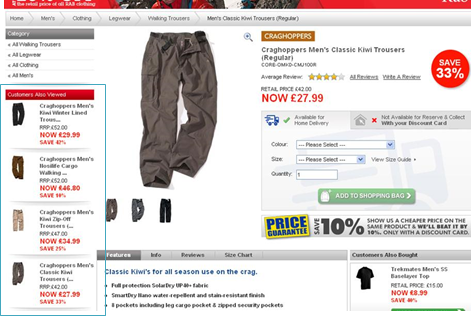 For example, take two visitors browsing the jeans category page. 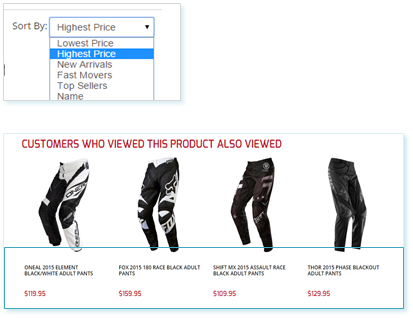 The one who sorts items by lowest price will see generic “on-sale” items recommendations, while the one who sorts items by ratings will see generic “top rated” recommendations. 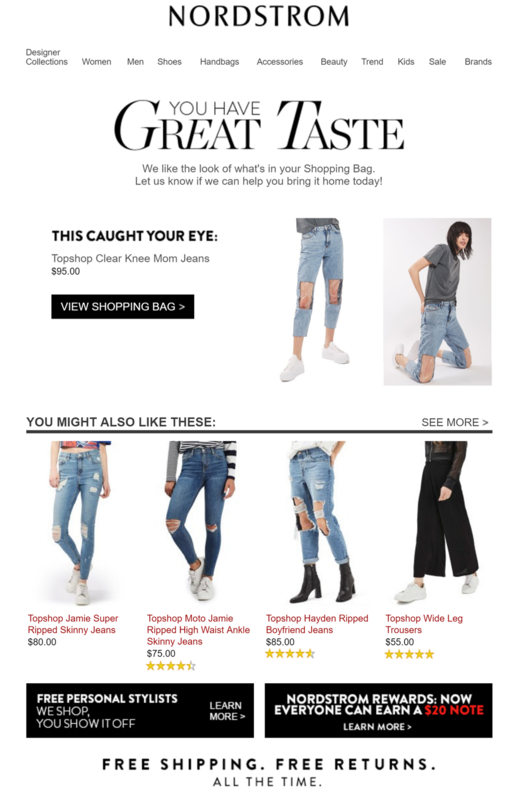 Once the engine collects enough data (often when the shopper reaches the category or product detail pages), personalized recommendation will begin to appear. Furthermore, when that visitor returns, they will have personalized recommendations from the very beginning. 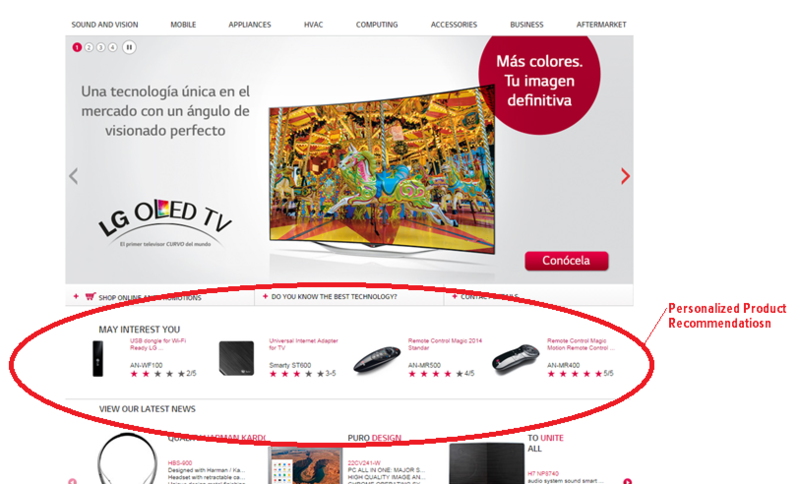 For example, a visitor who visited a site for the first time saw these recommendations of items from multiple product categories. After this visit, the engine understood this visitor has affinity to wine, so in their second visit they see only wine-related product recommendations. 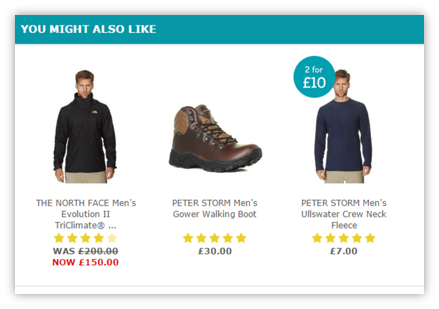 How Are the Product Recommendations Generated in Real-Time? 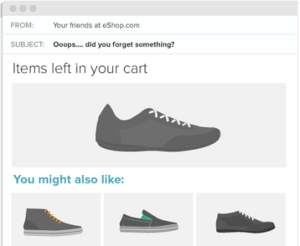 The real-time personalization of the items suggested is a notable advantage. This dynamicity of recommendations is important in order to match to the dynamicity of the shoppers’ preferences and needs and of the items’ availability. 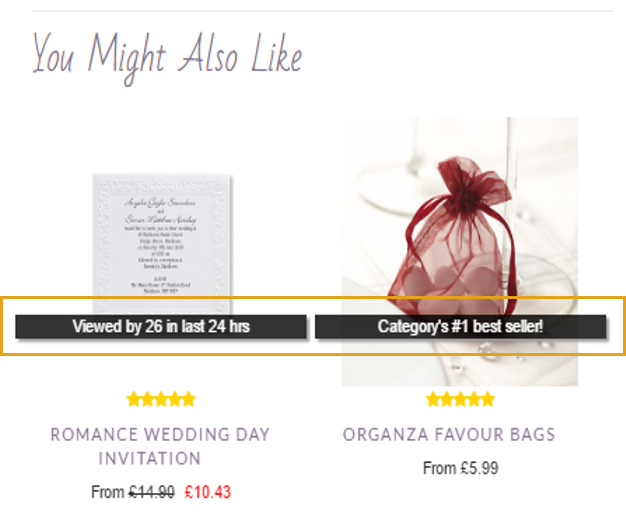 Ergo, the recommendations are extremely accurate and relevant for the specific moment in which the shopper views them. 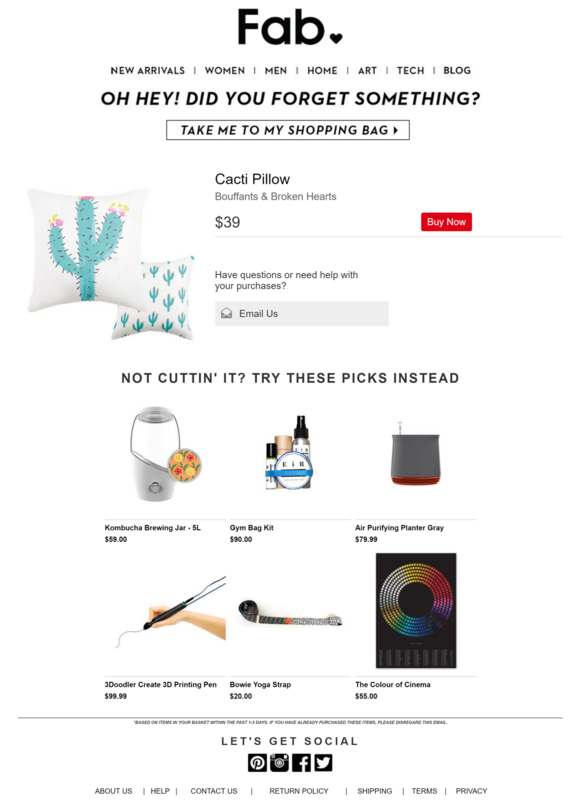 The engine presents cheap items recommendations to price-sensitive shoppers once they sorted a category from low to high. The engine only presents product recommendations that are in-stock for the size that the shopper has selected. In the example below, the shopper has selected the size 6M size, so the engine only recommends outfits that are in stock for that size. The engine presents product recommendations only of a specific brand once the shopper has showed affinity to it (browsed it frequently). For example, this customer has an affinity to Craghoppers trousers. Different engines generate the recommendations at different times. When the email is sent. When the customer opens the email, not when it is sent. In this case, the recommendations remain the same for 24 hours since the first opening of the email. A new set of recommendations appears if the customer reopens the email after 24 hours, to match any changes. The second option offers a more accurate personalization of the recommendations. 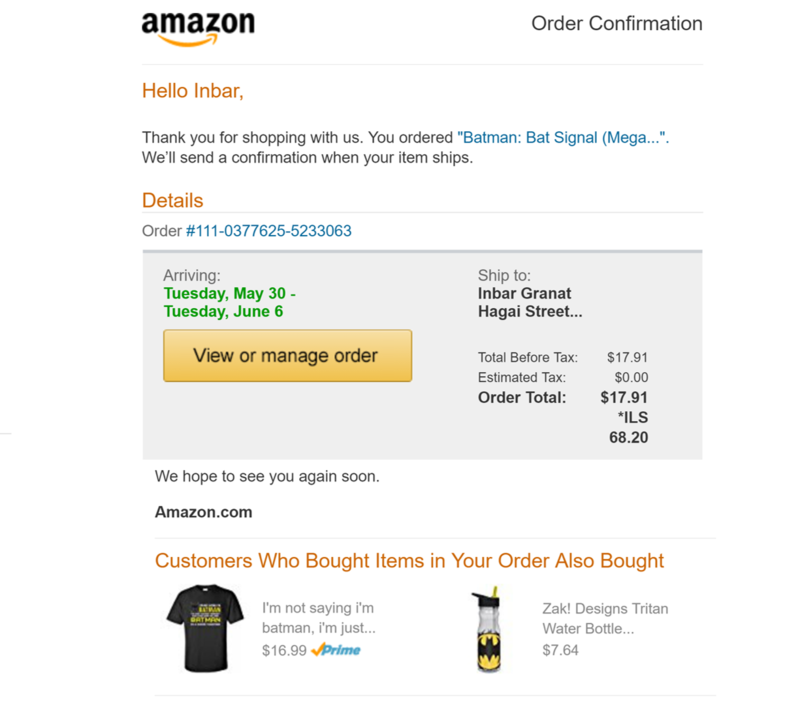 The items generated are relevant to the specific time of opening the email, which is when it is most relevant to the customer. Where Should You Implement Product Recommendations and Which Type? On different pages visitors are at different stages of their journey. Therefore, on each page, the recommendation type will be different in order to match the needs of the visitor. It is impossible to generate personalized recommendations for new visitors. So, at the beginning of their journey, the engine treats new and returning visitors differently. You can see below the best practices for the types of recommendations to use on each page. Note that each company is different and the optimal types of recommendations might differ for you to match your company, purpose, and branding. This page exposes the customers to items. 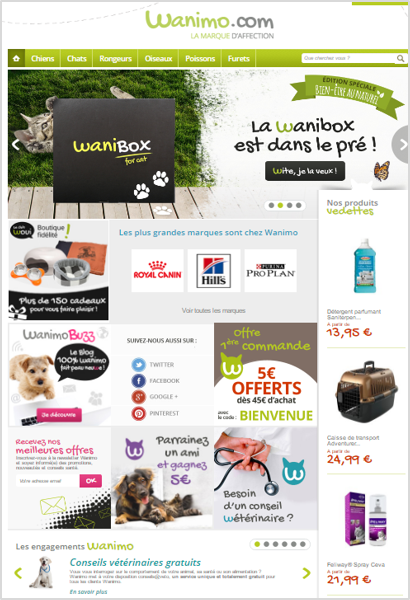 It is the first impression and therefore must have a strong impact on visitors to continue to browse. At this point, there is zero information about new/anonymous visitors, so they will view generic recommendations. The purpose of product recommendations on this page is most often to create a “shortcut” to finding desired items. The purpose of recommendations on this page is to keep the visitor interested and not leave the site. Visitors might leave if the product they are viewing isn’t satisfactory. To prevent losing a purchase, you can recommend alternative items (upselling) that better match the visitor’s standards and needs. For example, similar items that are cheaper, of different colors, of a slightly different shape but similar style, etc. After reaching any one of these pages the visitor might be frustrated and leave. 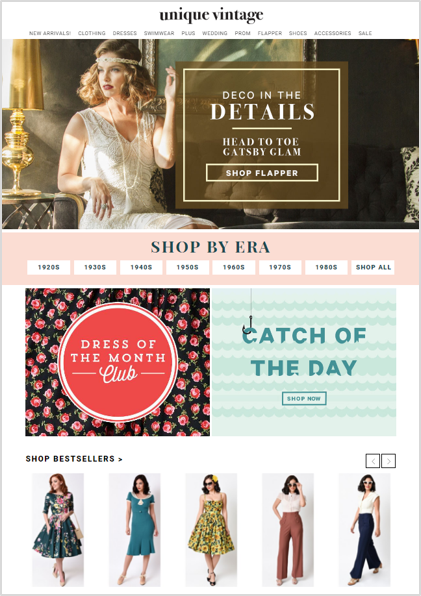 To keep the visitor on your site, entice him to continue browsing, by displaying desirable items. This page is a particularly tricky one. Recommendations used incorrectly here may result in cart abandonment. Provide all basic information on the recommendation feature. Have an “add to cart” button on the feature. Use a popup to provide more information, not a new page. 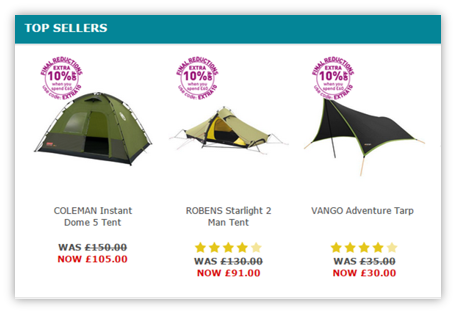 Pop ups such as a welcome pop up and exit intent pop up should include product recommendations in order to keep the shopper interested. Product recommendations are used in various triggered emails. Each email differs in its purpose, message, and target audience. The type of recommendation will vary as well. See below the best practices for the types of recommendations to use on each email. Again, consider that this is a generalization. The purpose of this email is to motivate the customer to return to the site and purchase the items they abandoned. 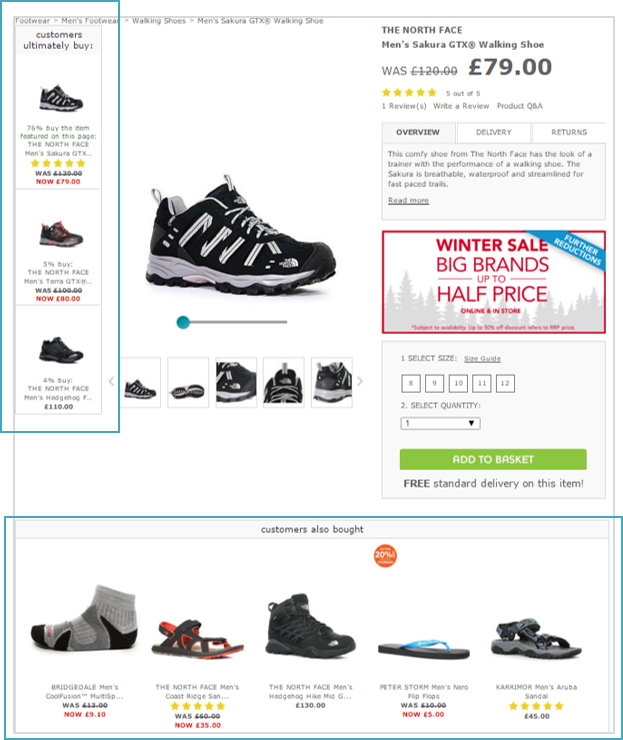 Product recommendations can be another motivator for the customer to click through. In some cases, product recommendations are an even bigger motivator than the abandoned items. This is sent to customers who abandoned due to product’s undesirable characteristics, price, color, size, etc.). See Nordstrom’s example, which recommends similar, cheaper items to the item abandoned. This is sent to customers who abandoned due to needing more time or being forgetful, to increase the average order value while sending a reminder about the abandoned items. Fab’s product recommendations in the cart abandonment email are from completely different categories that the item abandoned. In this email, which updates customers about products, you can also bring to the customer’s attention items they may like but have not seen before. Use a personalized mixed strategy of upselling and cross-selling related to the product updated. According to a Barilliance study the click-through-rate (CTR) more than doubles and sales are 1.7 times more effective for above the fold recommendations than below the fold. The same study found that the CTR of personalized “top sellers” was double than the CTR of non-personalized “top sellers”. An additional Barilliance study shows that integrating data from all channels is important. 46% of surveyed customers want personalized product recommendations based on in-store purchases. The same study in 2014 found that this recommendation is the most engaging type out of 20+ recommendation types tested. A Barilliance study in 2015 found that this recommendation type generated the most revenue – 68.4% of all revenue (see graph below), out of 20 recommendation types. Points 3 and 4 show how effective social proof is and how strongly shoppers’ reliance on other shoppers’ actions is to make shopping decisions. The more engaging it is, the higher the probability of click-through is. For example, a change of image (i.e. product’s angle) on-hover is engaging. Using shoppers’ information for product recommendations raise privacy concerns for some shoppers. You can avoid this by allowing customers to delete their browsing history or by offering them to provide feedback about the recommendations and change accordingly. Each company has a different purpose, branding, and audience. Therefore, the optimal way of using the recommendations changes from company to another. A/B testing is crucial to find the optimal way of using recommendations for your site. It optimizes the recommendations’ location, type, mix, number of items, number of recommendations per page, size and more. It can help you find how even the smallest change, such as the color of the product recommendations title, affects your conversion. On this page customers are searching for the ‘right product,’ so if you present cross-selling items you will confuse them and distract them from the process. Hence, on this page, focus your efforts on helping them find the right item by upselling to match the shopper’s specifications. According to a Barilliance study, the CTR of “customers also viewed” (upselling) was double the CTR of “customers also bought” (cross-selling) on the product detail page. 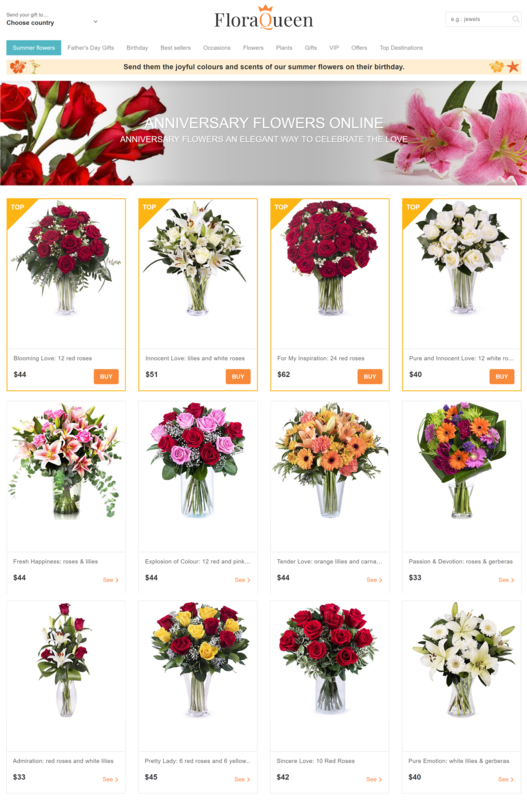 On this page customers have a high intention of making a purchase. They have already selected an item. If you show them similar items you may cause hesitations. Customers may re-open their research again, deterring them from making the purchase. Thus, cross-sell on this page. This will eliminate the chance of distracting them while likely increasing the average order value. It is important to offer shoppers choice, however too many choices can be confusing and result in a lower conversion rate. Use A/B testing to find out the optimal number of choices for each recommendation set. The study from 2015 by Barilliance shows the discrepancy between the use of this recommendation type by e-tailers (30.9% of sites on cart page) and the revenue it secures (7.9% of revenue) (higher revenue = buying more items or buying higher valued items). As the Barilliance study shows, 42.5% of sites use this recommendation type, but it secures only 16.1% of revenue. For conclusion, dynamic product recommendations are extremely important. They introduce visitors to relevant items in a quick and easy manner, creating a better customer experience. Consequently, they increase customer engagement, conversions, click throughs of emails, average order value, loyalty, and retention. The items recommended are automatically personalized and are dynamic, to sharpen up the relevancy and to match potential changes (customers’ preferences and items’ availability). Now that you have learned the various types of product recommendations, which types fit which location on-site and in emails, and of the dos and don’ts, you can implement an effective product recommendations campaign. Always remember that your company is unique. You have unique branding, personality, audience, and items. Therefore, your product recommendations must match all of these, which you can customize, personalize, and test.